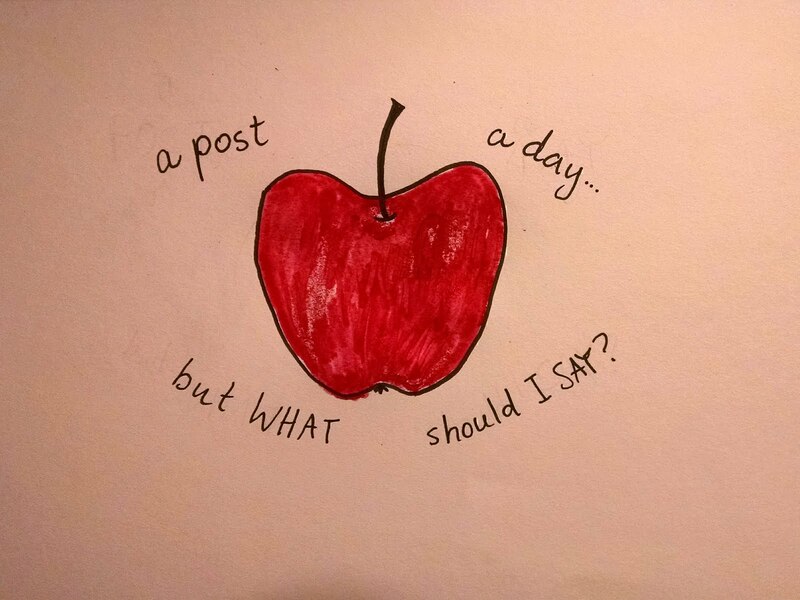 What do you mean it's an APPLE a day? I've been having so much fun creating more with the drawing challenge that I did in January, that I'm going to keep creating daily! In February 2016, you can expect a post each day here on Everead. It's bold. Blogging has changed quite a bit since I began, back in 2007. Lots of the things we used to put on our blogs are things we now put on social media, instead. If you check out the archives of Everead (which begin in 2008) you'll see that I was posting shorter posts, more frequently. But I've never been a daily blogger. In October 2008 I posted 25 times, sometimes twice in one day. But 25 posts in a month is the most Everead has ever seen. I intend to change that. I confess I'm planning on cheating . . . just a little bit. Since I observe the Sabbath on Sundays, I plan to write Sunday posts ahead of time and schedule them to publish automatically. If I'm really on top of it, I'll do that for some other days, too, and then I'll squeeze in more than one post a day. Millions of posts!!! I'm really excited about this! Also a little nervous. I'm not worried that I'll miss a day, I'm worried that people will wish I had just skipped a day rather than posting what I posted. Heh. So, if you want to give me a boost this month, comment on my posts. Or send positive vibes in some other form. Preferably a form I can actually discern; bear in mind that I'm not actually psychic and can't tell if you're smiling at your screen. This month of daily blogging is going to give me a chance to tell you about some great books, old and new. It's going to push me to come up with something interesting and valuable to write each day. It's going to help you get to know me better, and I hope it'll help me get to know YOU better, too. So let's start off with a question: What would you like to hear about, from me? What should I post about??? That post idea I mentioned to you---what to do when your kid reads TOO much, how to recognize where to draw the line, etc. I'd love your thoughts on that. YES! I am definitely planning on speaking to that. I think it's a super relevant topic! You have posted about more nonfiction recently. And I have recently been more interested in historical works. How does one begin reading in a new genre? Do they have awards for historical writings? What questions should I be asking to be sure I get good reading experience/satisfaction? I'd love to hear your family favorites (both you growing up, and your family now). And next, a question. My 6-year-old is an advanced reader and could read nonstop, but I need lots of book ideas to keep him going. (Series are good.) He will read pretty much any genre, but especially loves a good mystery. Some favorite series have been Magic Treehouse and A to Z Mysteries. I don't want him reading anything too scary or rude. I guess what I'm saying is, I'd love suggestions for quantity and quality and age appropriate...nothing much, ha! Do you have any strategies for choosing content appropriate books for a very high reader? As Kolt gets older, the time necessary for me to check all of his reading material is becoming too much. I have a couple of go to's but would like to know of anything I am missing in this area. He is a brilliant reader but obviously some topics are too much and sometimes you can't tell by reading the back of the book.